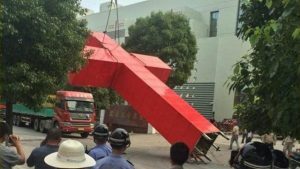 The authorities arrested believers at the site of Sanjiang Church in Zhejiang Province who were observing a moment of silence to commemorate the church’s demolition four years ago. The Sanjiang Church in Zhejiang’s Wenzhou city was demolished using explosives in April 2014, which was widely reported in international media and caused a widespread condemnation in China and abroad at the time. Hundreds of people were deployed to destroy the church, which cost about 30 million RMB (over 4 million USD) to build, and was turned into ruins in merely ten hours. On April 28, 2018, the fourth-year anniversary of the destruction, several members of the church’s former congregation were returning from a funeral and stopped by the church’s ruins for a moment of silence. Immediately, scores of police officers surrounded the believers and arrested them. Only after their interrogation has determined that it was not a predetermined action were they released. According to informed sources, Christians who were imprisoned for protesting the church’s demolition in 2014 are still under strict surveillance. Not only are they required to carry their mobile phones at all times and report their whereabouts, but they are also forced to report monthly to the authorities and undergo indoctrination meetings, which authorities call “education.” Even the Christians who have severely-ill family members are not spared the persecutions. 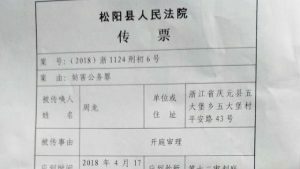 On the third-year anniversary of the demolition, the police detained pastor Huang Yizi who has been previously imprisoned for protesting the church in 2014. According to analysts, the Chinese Communist Party consistently deploys additional forces during anniversaries of events such as demolition of churches or deaths of prominent people to keep an eye on “sensitive groups” and strictly control public opinion. For example, the police detained over a dozen people attending the memorial service on the seventh day of the passing of Chinese Nobel Peace Prize laureate Liu Xiaobo (in Buddhist and Daoist tradition, the deceased’s soul remains in the body for seven days before ascending to heaven). The authorities blocked any events to commemorate the first anniversary of Liu Xiaobo’s death.